Winter weather can bring cold spurts and overnight temperatures that slip below freezing causing the water inside of pipes to freeze. When the water freezes it expands and sometimes this causes the pipe to crack, break, or leak. Even when insulated, pipes can sometimes freeze. Knowing what to watch for will help you be better prepared to take action should you experience an unexpected leak in your home or business. As frozen pipes unthaw, broken ones will reveal themselves as leaks or running water. Unfortunately many homeowners do not notice the leak until floors and carpets are soaked and damage has already been done. Once a broken pipe is suspected, is important to turn off the water at the main valve until repairs are made. The amount of water that leaks into an interior will determine to the extent of damage. Leaks or running water inside a home or business can damage wood, carpets, walls, and sub-flooring. Broken pipes in upstairs areas can damage ceilings. After leaks are located and the pipes repaired it is vital that all of the water that leaked out is completely removed. All of the moisture and dampness must be thoroughly dried or the area will become at risk developing mold. Mold is in the air at levels not noticed until moisture is present. In a moist environment, mold spores will stick to surfaces and begin to grow in as little as one full day. Mold can grow on wood, beneath flooring, and on walls. Prompt, professional clean up and drying is essential after a water leak or flooding. Mold infestations can cause a host of serious respiratory illnesses. 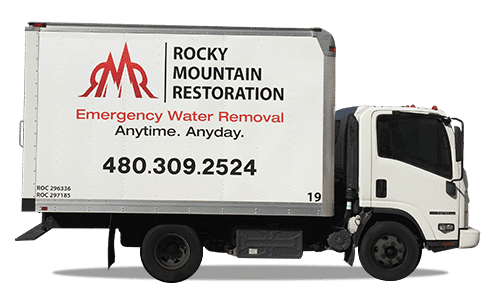 An assessment by a trusted water damage restoration company in AZ is the safest way to ensure proper drying after leaks and to ensure a healthy living environment.